Ireland's showjumping team will not be competing at the Olympics after failing in their final protest over a bizarre incident at the European Championships. The Court of Arbitration for Sport dismissed the Irish appeal over the results from August's event in Aachen. 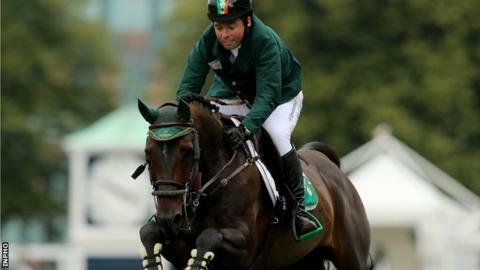 Ireland claimed they had been denied a crucial clear round when Cian O'Connor was distracted by a member of the ground staff running across the arena. O'Connor's horse knocked down the next fence and the Irish missed out on Rio. If O'Connor had completed a clear round Ireland, and not Spain, would have landed a place at next summer's Games in Brazil. The European Championships counted an a qualifying event for the Olympics. Ireland had already had an appeal against the result rejected by the International Equestrian Federation (FEI). Meath rider O'Connor, 36, expressed his disappointment at the outcome on Facebook. "I tried everything and left no stone unturned in trying to seek fairness for what I felt was an unsporting decision made by the ground jury in Aachen," he said.